Peter Stuyvesant Little League President Peter Ramos was all smiles during a visit to the Town & Village office last week. Though he’d only stopped by to pick up a few copies of a recent issue, he also left with the official state certificate of incorporation for the PSLL, written in 1956, the year the league was established. Without even knowing it, T&V had been holding on to the certificate for the PSLL for many years, as it had been stored in a garage owned by T&V’s publisher Chris Hagedorn. He found it recently when going through the space and the document had been preserved by his father, T&V founder Charles Hagedorn, before that. After it was brought to this newspaper’s office in Flatiron, it was turned back over to its rightful owners, the 700-plus member little league. 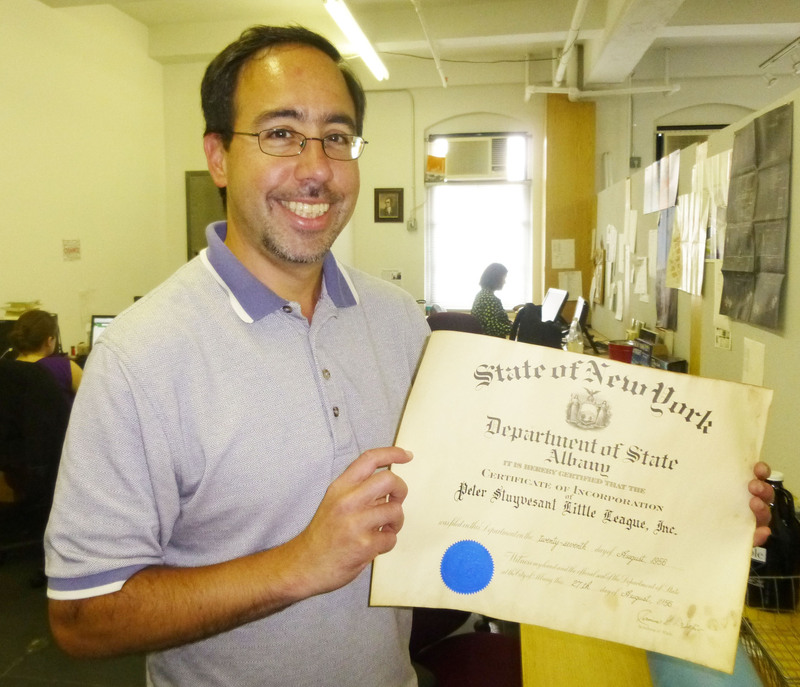 Though it isn’t known why exactly the certificate was in T&V’s custody in the first place, in the paper’s early days, when the office was located on East 14th Street between Avenues B and C, there was a lot more space that could be used for storage and other things. The office was the venue for occasional community meetings and was also a workspace for the Stuyvesant Town Camera Club. By happy coincidence, the document is just the sort of piece of PSLL history Ramos has been hoping to start collecting, along with old photos of games and other events from years (and decades) past for an archival project. Anyone who has photos or other league-related relics to share (which Ramos promises will be returned) is asked to contact him via email at petercramos@aol.com.